“I walked out of The Matrix and I was thinking, ‘What kind of science fiction movie can people make now? '” recalls Darren Aronofsky. “The Wachowskis took all the great sci-fi ideas of the 20th century and rolled them into a delicious pop culture sandwich that everyone on the planet devoured.” To celebrate the 10-year anniversary of the most influential movie in modern sci-fi, we reveal the 12 movies and books that inspired it. “We wanna do that for real,” said The Wachowski Brothers, after showing producer Joel Silver this groundbreaking existential anime. No kidding. The title sequence, camera angles, sound design and numerous gun battles are near-identical lifts from Ghost In The Shell,which happens to feature fetishised, philosophising characters diving into cyberspace via sockets in the backs of their heads. Seek it out. The Wachowskis didn’t stop at borrowing Dark City’s shadow-noir style and its world-behind-the-world plotline. They swiped its sets, too. The rooftops that Trinity runs across at the beginning of the film are the same ones that Rufus Sewell runs across in Alex Proyas’ cult sci-fi thriller. You already know William Gibson’s seminal cyberpunk novel, even if you don’t. It’s that influential. The Wachowskis pay their dues: both The Matrix and Neuromancer feature a computer hacker, an all-powerful artificial intelligence, a place called Zion that’s populated by Rasta-men. No wonder Gibson called Neo his “favourite ever sci-fi hero”. After Ghost In The Shell, the biggest and least-known anime to influence The Matrix is this 1985 sci-fi thriller. Unfolding in a post-apocalyptic future, it sees a young biker stumble upon the fact that Tokyo now only exists as a simulated reality. Government agents begin hunting him down. The Wachowskis begin taking notes. Believe it or not, the immortal TV series coined the term ‘Matrix’ way back in the ’70s. Probably a coincidence. Apart from the fact it described a giant virtual reality computer system. Which you enter using a device connected to your head. And if you die there, you die in reality. Yeah, definitely a coincidence. Comic-book author Grant Morrison reckons the Wachowskis flatly ripped off his counter-culture comic series The Invisibles. He might have a point. Then again, Morrison wasn’t shy about stealing from the work of author-philosopher Carlos Castaneda, who wrote about an unknown “nonordinary reality” which could still be reached by man. “Matrix” is definitely catchier. Remember that scene where Trinity slides down the stairway on her back, twin hand guns at the ready? Take a look at John Woo’s A Better Tomorrow II. You’ll see Chow Yun-Fat (happily, not wearing a latex catsuit) do exactly the same thing. In fact, take a look at any fistful of ’90s Hong Kong actioners. Chances are, The Matrix’s fight choreographer Yuen Wu-ping worked on quite a few of ’em. Blatant one, this. Neo follows the white rabbit (tattoo) down the rabbit hole (mirror) to join a gang of misfits in another world. And Morpheus can’t shut up about it. A subtler reference? Check out the floors in the Lafayette Hotel where the cat (glitch) walks by. They’re all back-and-white checkers, just like the chessboards in Lewis Carroll’s surreal odyssey. “What is it?” asks Arnie, when offered a red pill in Paul Verhoeven’s bloody sci-fi scorcher. It’s a symbol of his desire to return to reality, comes the reply. 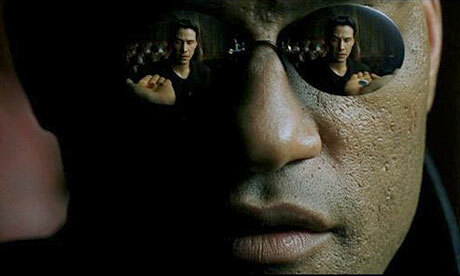 Morpheus gives Neo exactly the same pill, exactly the same option. Both men turned it down. One of them got kicked in the balls by Sharon Stone. Probably not your bookshelf, but it’s on Wachowskis’. And Neo’s. In an opening scene, Neo hides an illegal minidisk in a false copy of Jean Baudrillard’s philosophical tome, which posits modern life as a hyper real simulation. See the brain-in-a-vat theory, Plato’s cave and most of Greek myth for more thievery. Or don’t. Whatever. The Matrix makes two definite nod-nod-wink-winks at this cyberpunk anime mind-blower. First, when Neo meets a group of spoon-bending psychic children in the Oracle’s waiting room. Second, when Neo’s breathing seems to shudder the walls of reality in the corridor as he flexes his new-found powers. Happily, Neo doesn’t splat into giant blamange of tentacles like Akira’s unfortunate superman. “IS 5416” is the license plate of Agent Smith’s car. Grab a Bible, skip to Isaiah 54:16 and you’ll find this: “Behold, I have created the Smith…” Loads more where that came from. Some believe Neo, Morpheus and Cypher are doubles for Jesus, John the Baptist and Judas respectively. Jesus knows kung fu? Say your prayers, kids.